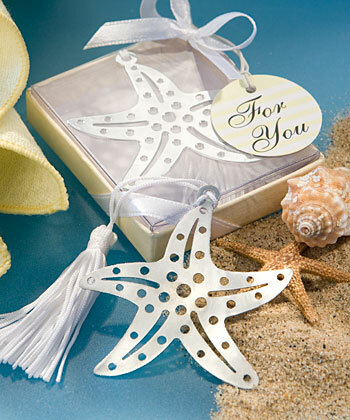 These Book Lovers starfish bookmarks make beach themed favours with true star power. Planning a beach themed or beach side occasion? Well, plan on these starfish bookmarks as the perfect keepsakes of a picture perfect day. Each bookmark measures 6" with tassel and has a silver metal starfish shaped charm adorned with detailed cut-out enhancements. Attached at its top is a white tassel designed to peek out from the pages of a book. Guaranteed to stir waves of memories of your day in the sun, each comes in a clear topped box with an ivory base, tied with a white satin ribbon and an attached white and ivory striped "For You" tag.